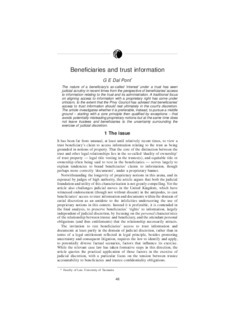 The nature of a beneficiary’s so-called ’interest’ under a trust has seen judicial scrutiny in recent times from the perspective of beneficiaries’ access to information relating to the trust and its administration. A traditional focus on aligning access to information with a proprietary right has come under criticism, to the extent that the Privy Council has advised that beneficiaries’ access to trust information should rest ultimately in the court’s discretion. The article investigates whether it is preferable, instead, to pursue a middle ground – starting with a core principle then qualified by exceptions – that avoids potentially misleading proprietary notions but at the same time does not leave trustees and beneficiaries to the uncertainty surrounding the exercise of judicial discretion.